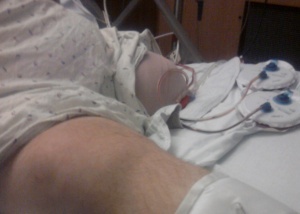 Amputation is the removal of an extremity by trauma, prolonged constriction, medical illness or surgery. As a surgical measure, it is used to control pain or a disease process in the affected limb, such as malignancy or gangrene. In some cases, it is carried out on individuals as a preventative surgery for such problems. 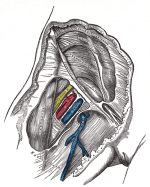 A special case is that of congenital amputation, a congenital disorder, where fetal limbs have been cut off by constrictive bands. In some countries, amputation of the hands, feet or other body parts is, or was used as a form of punishment for people who committed crimes. Amputation has also been used as a tactic in war and acts of terrorism; it may also occur as a war injury. Phocomelia: "a congenital deformity in which the limbs are extremely shortened so that the feet and hands arise close to the trunk"
Initially, the arterial and venous supply are ligated to prevent hemorrhage (bleeding). The muscles are transected and the bone is sawed through with an oscillating saw. Sharp and rough edges of the bone are filed down, skin and muscle flaps are then transposed over the stump. Distal stabilisation of the muscles is recommended, allowing for effective muscle contraction and reduced atrophy. This in turn allows for a greater functional use of the stump and maintains soft tissue coverage of the remnant bone. Muscles should be attached under similar tension to normal physiological conditions. 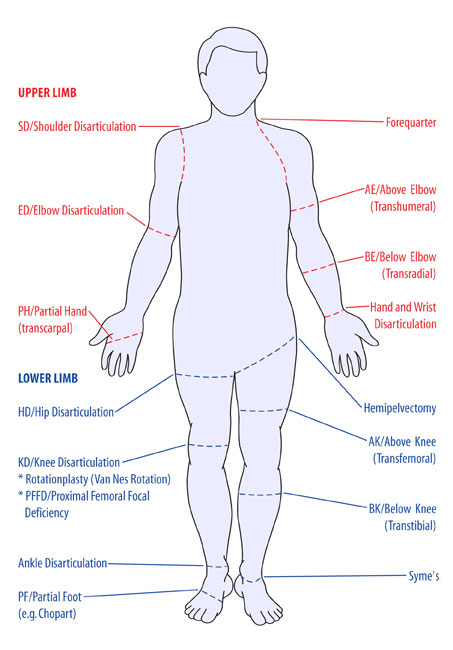 See here, for more detailed information on post-operative complications following an amputation. ↑ Wikipedia. Amputation. http://en.wikipedia.org/w/index.php?title=Amputation (accessed 29 May 2014). ↑ Day HJB. The ISO/ISPO classification of congenital limb deficiency. Prosthetics and Orthotics International 1991; 15: 67-69. ↑ MedlinePlus. Medical Dictionary, phocomelia. http://www.merriam-webster.com/medlineplus/phocomelia (accessed 29 May 2014).